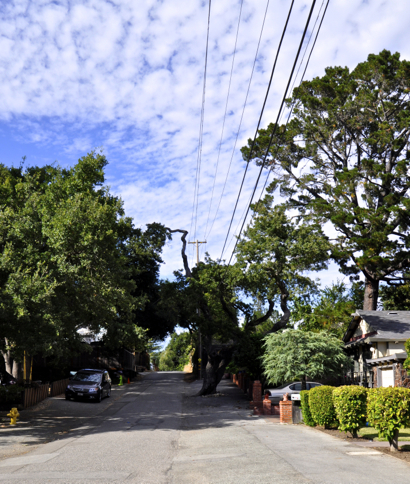 At least to this observer, “avenue” implies a larger roadway than Croner Avenue, a narrow passageway sandwiched for about a quarter mile between North Lemon and Orange avenues in Menlo Park. We ambled upon it one day while walking the dog and talked to one of the residents who indicated that some of the houses on the street might have served as officers’ quarters during Camp Fremont. Jym Clendenin of the Menlo Park Historical Association thinks this is unlikely. “I can’t find any information on those cottages being officers’ quarters or being there at all in 1918. 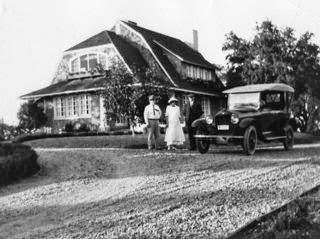 They all have single-car attached garages, which would have been highly unusual in 1918. I suspect those cottages date from the 1930s. “The map of Camp Fremont does show a large house at 1812 Santa Cruz Avenue (picture, right) with three smaller structures in back. (This house is more or less in line with 1799 and 1701 Croner). “The house, known as the Wolfe House, was designed in 1907 (or possibly earlier) by Willis Polk, a San Francisco architect well-known for both residential and commercial structures. The house was moved a few hundred feet and underwent extensive modifications in about 1990. That these buildings could be stables leads to another theory about Croner — that it was once a small lake. “The lore that I’ve heard, but have not been able to verify, is that it was once a lake, with the low point being where the house at Orange and Croner stands now,” explained Jeff Scroggins, who’s lived on Croner since 1999. “There was a manmade dam, and horses were brought to the lake for water. Whatever the case, it is true that the third of Croner closest to North Lemon is much higher than the rest of the street. And that the small houses now sport individual personality thanks to their owners! Correction: the USGS quad is 1898, not 1998, and was produced in conjunction with establishment of Stanford University. It shows all actual (rather than proposed or planned) structure and street in the area.